If you practice yoga regularly or even if you’ve only taken a couple classes, chances are you would have been invited to join your teacher in chanting ‘om’. Typically, this will be a chant repeated three times at the beginning or end of a class. Now, I’ll be the first to admit that this might sometimes feel a little awkward in a room full of strangers, especially if you’re new to yoga. But although this ritual can feel a little strange, it’s an important part of the yoga practice and once you understand the meaning behind ‘om’ and why it is important, I’m sure you will be singing it from the rooftops in your next class. So what does ‘om’ mean? ‘Om’ should technically be spelled ‘aum’ and is a mantra and sacred sound that is traditionally repeated at the beginning and end of a yoga practice. It is a Sanskrit word that translates to ‘source’ or ‘supreme.’ In Hinduism it is said to be the sound of the universe, so by chanting it we are symbolically and physically recognising our connection to all other living creatures and the universe. Even though it sounds like one sound, ‘Aum’ is actually made up of four syllables: A, U, M, and a silent syllable. The first syllable is A and it is pronounced as a long "ahhhh" which starts as the back of your throat. The U, sounds like a prolonged “oooooh”, and here you should start to feel your throat vibrate. The third syllable is M, “mmmm” which sounds like a lot like the noise you would make if you were drooling over a really good-looking slice of pizza. You will now feel your mouth and lips vibrating. The final syllable comes as you merge your chant from ‘mmm’ into deep silence. You should feel a powerful energy that fills the room for a few seconds after the chant ends. One of the most amazing things about ‘om’ is that it’s actually the sound vibration of the word that is most important. As you chant ‘om’ you should feel the small vibrations ripple through your entire body. Not only do these vibrations feel great, they also have a very positive affect on the body by slowing down the nervous system and calming the mind in a way similar to meditation. And of course, when your mind is relaxed, your blood pressure decreases, your heart is happy and your overall health ultimately improves. 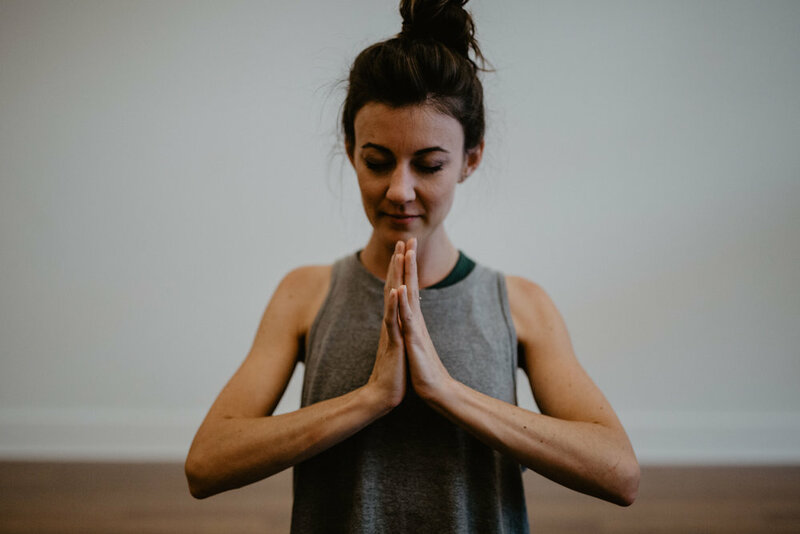 It is also a great way to separate our practice from the rest of our day, signifying that this time we dedicate to yoga is a special time where we take care of ourselves and practice being mindful. Beginning and/or ending your practice chanting ‘om’ may also help foster a deeper connection than simply just physical yoga poses. If you ask me, the benefits of repeating this tiny little word far outweigh those few seconds of awkwardness you may feel, and honestly like most things the more you do it the easier it becomes. There’s a good chance you may even start to enjoy yourself, so the next time your teacher begins the class with ‘om’, give it a go and join in the chanting loud and proud. Your body will thank you for it! Namaste on Williams offers a new student special of 30 days of unlimited yoga for $40 AND also has an unlimited yoga membership for only $65 (limited time offer). You can check out our class schedule at www.namasteonwilliams.com/schedule.